Special thanks to J-Garden for extending this food review invitation. They say that third time's a charm, and charming indeed is my third visit to J-Garden. As experienced previously, J-Garden is known for innovative dishes that combine Japanese ingredients with Western culinary know-how. During my earlier visits, I encountered intriguing dishes such as carbonara with shimeji mushrooms and finger food with smoked duck. The indoor dining section of J-Garden is spacious and well-lit. This makes this restaurant a suitable place for working people and families alike. There is also an outdoor section with greenery and garden-style tables and chairs. Indeed, it would have been ironic if J-Garden did not have a garden! In its continuous effort to delight customers, J-Garden is introducing new dishes from time to time. One such example is Salmon Cream Croquettes (サーモンクリームコロッケ, RM23.00), which come with rice and a bowl of miso soup (味噌汁). The croquettes are served with Japanese curry, whose aroma has noticeable improved using 4 types of spice from Japan. Each piece of croquette is filled with a creamy mixture of salmon and seasoning. Although its surface is crispy, the overall texture of croquette is dominated by the creamy filling. The croquette is slightly sweet, blending well with curry as well as other ingredients like shimeji mushrooms, snow peas, broccoli, carrots and baby corn. The next dish is Chicken Roulade (チキンルラード), whereby a slice of chicken breast is wrapped around a core of walnuts and onions. The appearance is similar to negimaki (ねぎ巻き) except that the latter uses beef and scallion. The chicken is reasonably tender while walnuts provide unmistakably delightful sense of crunchiness. I think this roulade can benefit from additional flavoring, perhaps with help of mint sauce or pesto sauce. Taking advantage of the chef's expertise in Western culinary arts, this dish is plated elegantly through the use of batter crisp and a variety of colorful vegetables. Teriyaki sauce (照り焼きのたれ) is provided in a small pitcher on the side. Due to its lengthy preparation process, the Chicken Roulade is only available through advanced ordering. J-Garden is also rolling out several types of fondue (フォンデュ) in conjunction with its new menu. There are 3 types of fondue (chocolate, cheese and Japanese curry), each comes with 4 compatible food items. There are 2 fondue sizes: small (for 1 to 3 persons) and standard (for 4 to 6 persons). Each caquelon (fondue pot) is kept warm by a burning candle underneath. The Chocolate Fondue (チョコレートフォンデュ, RM38.00 for standard size, RM32.00 for small size) is my personal favorite. Made from 70% cocoa, the fondue packs a strong punch which should pacify most chocolate lovers. Fortunately for me, it is not too sweet either. The Chocolate Fondue comes with sata andagi, chocolate brownie, marshmallow and mixed fruit. Sata andagi (サーターアンダーギー) is a popular pastry from Okinawa (沖縄). It is made from flour, eggs and sugar, but distinctively absent of butter. Eaten directly, sata andagi has mild sweetness and delightful crisp. I think the size of each piece should be reduced to avoid double-dipping. Chocolate brownie is delectable too. Unlike sata andagi, brownie only requires brief dipping because it tends to flake off when making contact with chocolate sauce. Reception to Cheese Fondue (チーズフォンデュ, RM42.00 for standard size, RM36.00 for small size) is a matter of extremes - either you like it or you don't. In my humble opinion, I prefer the parmesan cheese sauce to be thicker and has small amount of sweetness. This fondue comes with pork meatballs, toasts, potato wedges and mixed vegetables. Pork meatballs are tasty on their own, but they are too salty after dipping in cheese sauce. For the purpose of fondue, I think the meatballs can work with little or no salt. Also included are toasted bread with grated cheese; the latter was initially mistaken as grated coconut kernel. As the toasts absorb cheese sauce very quickly, I think a light dip should suffice. 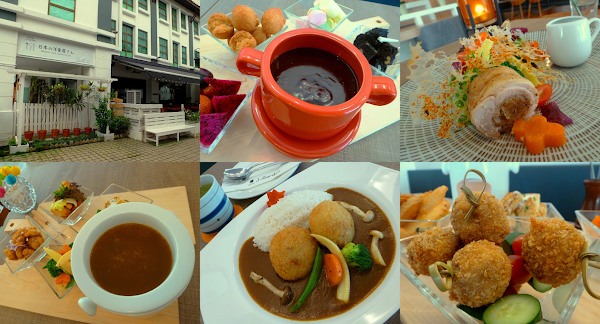 As for the Japanese Curry Fondue (カレーフォンデュ, RM38.00 for standard size, RM32.00 for small size), the curry recipe is similar to the one used for Salmon Cream Croquette. However, the 4 spices are blended in a different composition. As the curry has a salty edge on its own, this version of fondue is best enjoyed with beer. The 4 food items that come with Japanese Curry Fondue are fish fillets, chicken fillets, potato wedges and toasts. Fish fillets are delectable on their own, but I feel that they become too salty when coated in curry. The same can be said for chicken fillets. I think it works better if the fillets were lighter in seasoning. J-Garden is planning to introduce these new food items gradually, so the available dates of these new dishes are uncertain at time of writing. It is advisable to contact the restaurant for reservations as some dishes need to be prepared in advance. Directions: J-Garden is located near Queensbay Mall. The restaurant is the corner unit of a row of shops between Eastin Hotel and Shanghai Ding. Look out for signs for Econtel Hotel; J-Garden is located at the ground floor. There are parking spaces in front of and at the side of this row of shops, but vacant spaces can be scarce especially on weekends. I like the roll. Looks delicious!